Tipping the scales at over a pound (17.43oz / 494g) and ground from a piece of 3V carbon tool steel that begins at more 7mm wide, this stunning eel knife, or unagisaki in Japanese, is a one-of-a-kind Ben Tendick creation. 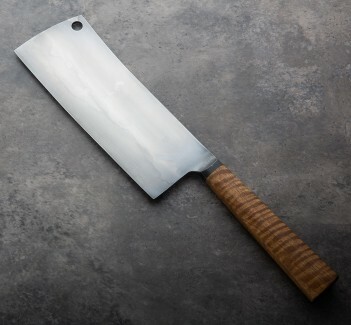 Shaped with a right-handed chisel grind on one side and hollow grind on the other with tumbled finish, the 205mm blade is designed with a sharp, heavy tip for piercing the head of an eel and a long straight edge, with what amounts to a secondary tip where the 45 degree angle is formed between the two edges, for dragging the knife along the body of the eel in one continuous motion. Here is an excellent video showing how an unagisaki is used. The hand-filling handle is large and beautifully rounded for comfort while handling this specialty knife, made from Ben's own homemade blue rag micarta and a piece of USA-made vintage black canvas micarta. A handmade black leather saya is included. 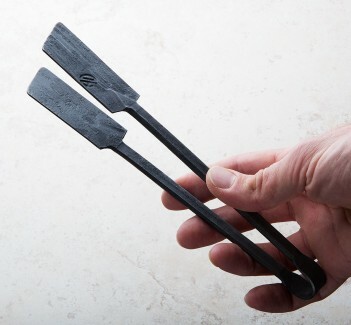 Ben Tendick pushes the limits of knife and tool creation at his one-man shop in Eugene, Oregon, designing and creating Japanese inspired culinary instruments and other edged instruments with a focus on hard, daily use and uncompromising function. in addition to kitchen knives and tools Ben has designed and made a collection of unique titanium sporks, spoons and chopsticks which complement his other wares nicely. Blade length: 205mm / 8.07". Overall length: 360mm / 14.2". Blade width: 7.4mm. Blade height at heel: 50.5mm. Weight: 17.43oz / 494g. Blade: 3V carbon tool steel. Handle: House-made blue rag micarta with antique black canvas micarta bolster. Leather saya.